What is the best way to celebrate one's 70th birthday? With family and close friends, of course. That is what Peter Low, founder of consultancy firm Edward de Bono Training, did. 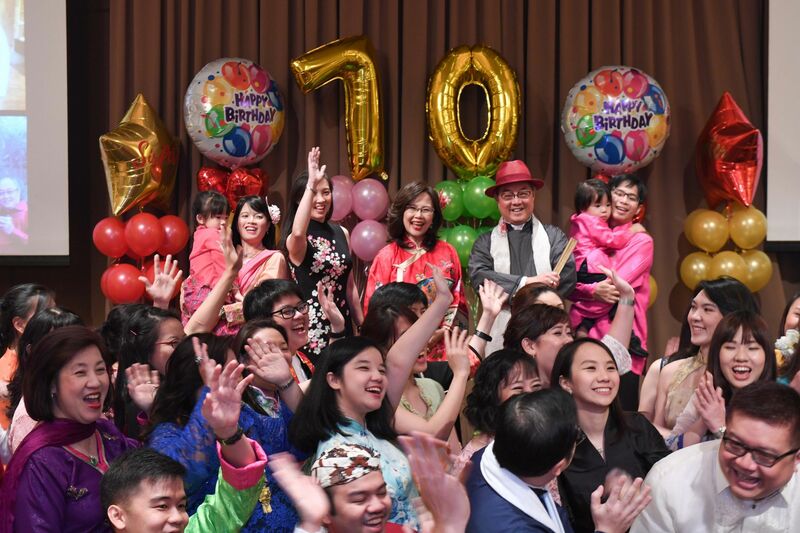 His daughters Lorraine Low and Lynette Low gathered some 160 family members and friends at the Grand Ballroom of the Conrad Centennial Singapore Hotel to mark Peter's Golden Jubilee. The evening was filled with music as guests took to the stage to perform and pay tribute to the birthday boy. His son-in-law, Ho Hua Sze, even played Chopin's Fantasie Impromptu on the piano, which left the crowd impressed, while several diplomats belted out musical blasts from the past. Dinner was an interesting affair too with four dishes served in the traditional manner followed by street food served the same way it was at the Orchard Road carpark in the 1960s.